My last post focused on combating segregation of aggregates in production but this post will primarily focus on how to deal with segregation of a stockpile after you have already made the product. Lets say you have a segregated aggregate base pile like the one I showed you in my last post. Your boss probably won't be keen on throwing out all of that material and starting over so how do you fix the problem once you already have a segregated stockpile? I'd say with a good loader operator and a few extra minutes before load out. When moving a stockpile to another location or loading material out of a stockpile and into trucks, the loader operator can perform an action called "fluffing the pile" to mix the material back up and de-segregate it. Your plant may call this by another name, I've heard it called "bucking the pile" and "mixing the pile" as well and I'm sure there are a hundred other names to it depending on where the plant is located. The important thing is how it is done. The loader operator will take three vertical cuts of the stockpile. His first cut will be in the middle of the pile and then to the right or left of the first cut as seen in the picture below. It is tempting to take only one big cut to fill the loader's bucket but the more cuts you take, the less segregated the load will be. 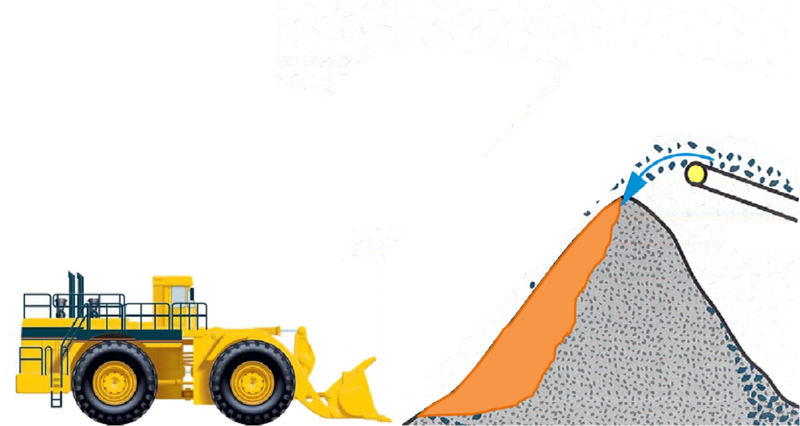 To take these cuts, the loader operator should place his bucket as low as possible in the pile without touching the ground. It is important that the loader bucket does not scrape the ground when taking material from a stockpile. The floor of your plant is made of a different type, size, and gradation of material than your stockpile and if the bucket of the loader scrapes the ground, the the material in his bucket is being contaminated. It should be noted as well that the lower 2 ft of the stock pile can also be contamin﻿ated with the native soil. This is especially prevalent in clean, fine products such as concrete sand. 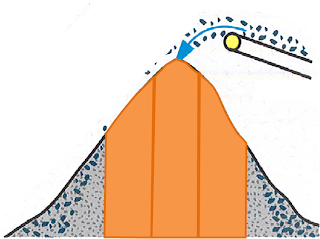 Mud can actually rise up into the stockpile, contaminating it and lowering the cleanliness of the material in the lower section of your stockpile. This is one reason that many plants are moving towards concrete or paved floors under their wash plant stockpiles. 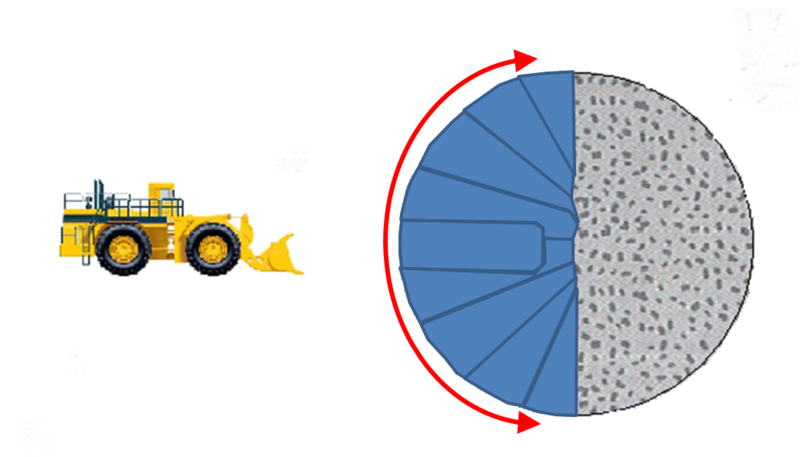 Once the loader bucket has been placed near the bottom of the stockpile, the loader operator should push the bucket into the stockpile and pull it upwards simultaneously towards the top of the pile as shown in the picture below. It is important that the operator does not just skim the outside of the pile and that he pushes the bucket into the pile as deep as possible in order to ensure that the coarse material on the outside and the fine material on the inside are both collected. After each cut, the loader will redeposit the material back on the side of the pile and start on the next section. This is an easy way to mix the material together before loading it into trucks to ensure that you have a homogeneous product. When your loader is loading trucks he should be sure to move around the outside of the pile and not just dig further and further into one section. In addition to safety concerns, the further into the center of the pile you go, the finer the material will be so it is important to continuously mix the outside of the pile with the inside as you move around the outside of the stockpile. The loader should start in the middle of one side of the stockpile, fluff that section, and move to each side as he loads trucks in order to make a full 180 degree arc along the side of the pile as shown in the picture below. This keeps your loads consistent because you are scooping similar material on each load and not sending out one truck of extremely coarse product followed by a truck of extremely fine material. It is also important to continue fluffing the stock pile as the loader moves to untouched parts of the pile, these sections need to be mixed just like the first section did. This is only one way of fixing a segregation problem at an aggregate plant and I'd love to hear about some of your solutions as well! 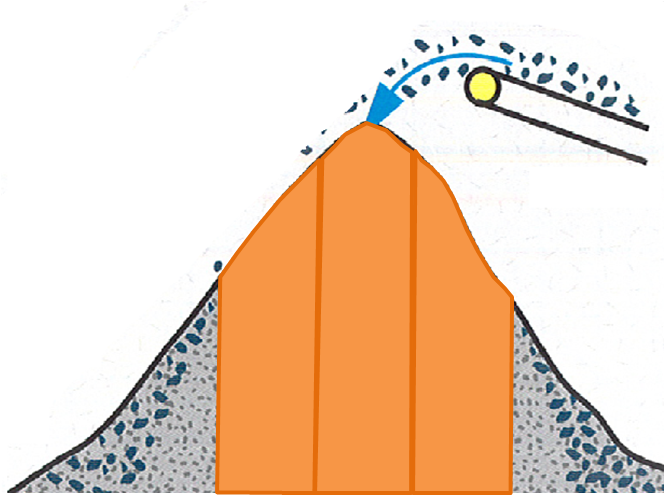 In keeping with the trend, my next post will focus on how to move and stockpile aggregates without segregation or degradation.